In Monday’s blog we learned about the Wright Brothers and how they invented the first motorized airplane. But there is much more to the story of their plane. 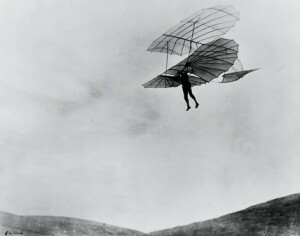 In fact, flight itself has been an aspiration of humans for centuries. Remember the ancient Greek legend of Daedalus and his son, Icarus, who made wings of wax and feathers and flew like birds toward the sun? 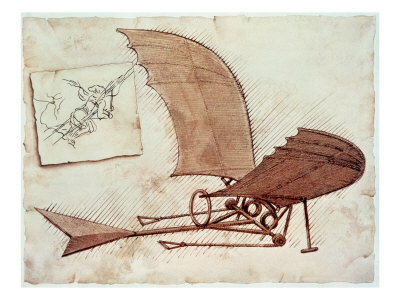 Leonardo da Vinci’s studies of flight in the 1480s included over a hundred drawings that illustrated his theories on flight. Inspired by the Wright Brothers, we thought we’d look into the history of the airplane. Critical precursors to the plane were kites and hot air balloons. Kites, invented by the Chinese around 400 BC, enabled inventors to study aerodynamics and gave them a sense of how wind flowed over and under a fixed wing for lift. But of course kites were too flimsy to carry a man, so everything learned was theoretical. Balloons, on the other hand, allowed people to leave the ground and float in the air, like a bird, giving the traveler the exhilarated feeling of flight. 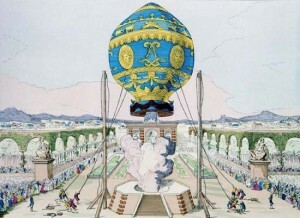 The first passenger balloon is credited to another pair of brothers, Joseph and Jacques Montgolfier who— in 1783—used smoke from a fire to blow hot air into a silk bag, which allowed the balloon to be lighter-than-air. The silk bag was attached to a basket, and the first passengers in this balloon were a sheep, a duck and a rooster. In 1799, a man named George Cayley built the world’s first glider. Many consider him to be the first true scientific aerial investigator and the first person to understand the underlying principles and physics of flight. Over the next 50 years, he made many improvements to the gliders; including changing the shape of the wings so that the air would flow over the wings correctly, and designing a tail for the gliders to help with stability. He also tried a biplane design to add strength to the glider. In 1849, Cayley built a large gliding machine and tested the device with a 10-year old boy aboard. According to Cayley, the glider “flew” with the boy on-board for a short flight. By 1891, a German engineer named Otto Lilienthal became the first person to create a real glider that would fly a person long distances. He was fascinated by the idea of flight, and wrote a book on aerodynamics based on his studies of the flight of birds which was published in 1889. After more than 2,500 flights, Lilienthal was killed when he lost control of his glider during a sudden strong gust of wind that caused him to crash to the ground. The story of his death and the gliders he flew later inspired Wilbur Wright to begin his studies of aerodynamics, and Lilienthal’s text was used by the Wright Brothers as the basis for their designs. Of course, in 1903, the Wright Brothers had their momentous event, and humans were now able to fly. Many improvements followed this event and things began to happen quickly. In 1905, Wilbur piloted a new plane design in a flight that lasted 39 minutes and covered about 24 miles. By 1906, Alberto Santos-Dumont made his first successful powered flight in Europe; and in 1909, a French aviator named Louis Bleriot made the first airplane crossing of English Channel. Then, in 1927, Charles Lindbergh completed the first solo, nonstop, trans-Atlantic flight, and international air travel quickly followed. A few years later, in 1930, a British inventor named Frank Whittle invented the jet engine that allowed people to go faster and farther than ever before, but that’s a story for another time. Hoverboards Are Almost on the Market! Happy (Almost) Birthday, Henry Ford!